On this page you can download the SuperTrend indicator software for free and you can get an MTF (Multiple Time Frames) alert indicator which gives you buy and sells signals via MT4, email and push notifications. The SuperTrend indicator is a great no repainting tool for detecting new trends and for timing your entries. The SuperTrend Indicator is even very useful to protect your profits, if you want to use it as a trailing stop. The following screenshot shows the trend detection with the indicator. As soon as the orange line starts drawing and the green line stops drawing then a new downward trend has started. If the orange stops drawing and the green line starts drawing then a new upward trend is detected by the SuperTrend inidcator. Before you read further you should download the free version of the SuperTrend Indicator. You will get an email with a confirmation link. After after you pressed the confirming the free indicator will be delivered to your inbox within 1 Minute. The non repainting SuperTrend Indicator for MT4 gives you buy and sells signals very early within a new trend. As soon as a new trend is detected you should wait for the first pullback and enter into the new trend. The SuperTrend indicator can not only give you good entry signals, in addition it can give you really good exit signals! 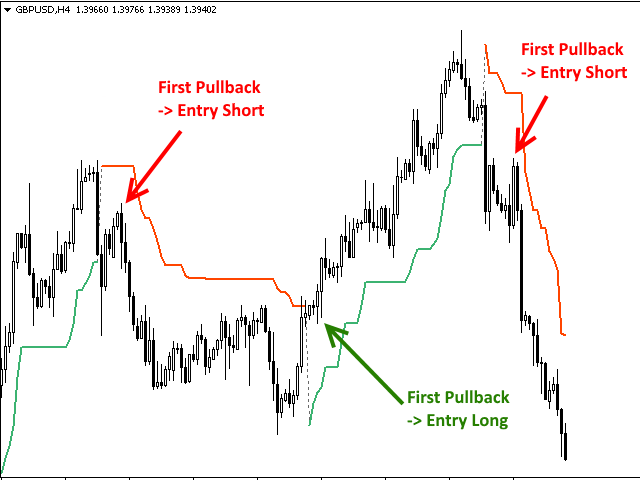 You can use the values of the SuperTrend Indicator as a reference price for placing a trailing stop. If you use that exit strategy, then you move your stops in direction of trade. Then your trades are ending when the stop of your open positions are hit. The SuperTrend indicator, as the name suggests, shows you superbly how the trends are established in a market. Using a combination of different technical indicators and math, the SuperTrend indicator plots on the price chart. It is relatively easy to use and is very popular with day traders or intraday traders. This is because during strong trending markets, the SuperTrend indicator will tell you when to buy or sell. But a word of caution is in order, as with all technical indicators, you should not depend on the signals of just one indicator. A SuperTrend indicator looks somewhat similar to a moving average. If you were to ask what’s the difference between a moving average indicator and the SuperTrend indicator, the answer lies in the fact that the SuperTrend indicators takes into account the true range of the price as well as the relative high and low prices. This is where it becomes very distinctive and unique from the moving average, which is also a popular trend following technical indicator. The moving average indicator simply relies on the average price over the past periods. You can of course tweak it to use the high/low price or other combinations. Depending on the type of moving average, you can make some small tweaks to the indicator, but that is all about it. When price tends to turn flat, the moving average indicator can become less reliable. The SuperTrend indicator on the other hand uses the volatility of the price and then gauges the trend. This makes it unique because volatility tends to rise and fall just before the momentum sets in. When you have a trend with a strong momentum, you can be sure that the volatility also rises along with it and thus signals you clear trends. In the subsequent sections of this article, we will take a look at what is a SuperTrend indicator and how it works and how you can use this indicator to enhance your day trading. What exactly is a SuperTrend Indicator? The SuperTrend indicator was developed by Olivier Seban; it is tuned to work across multiple timeframes. It is also put to use across different markets spanning from forex, futures to stocks. The SuperTrend indicator is often considered an intraday trader's tool because it works with relative ease, from the intraday time frames such as fifteen minutes to larger time frame charts such as daily or even weekly time frames. SuperTrend indicator is an advanced technical indicator that probably goes with today's trend trader, which is to keep it simple and quick. Traders tend to make the mistake of using multiple indicators, which may become redundant or give conflicting signals even. For all technical indicators are some sort of mathematical averages of the original data – price. Therefore, the more technical indicators you use, the further you may get away from understanding the price action itself, and get all confused. The SuperTrend indicator tends to eliminate this need. This indicator keeps your charts clean but also allows you to use other complimentary indicators such as technical oscillators. The above chart shows the SuperTrend indicator applied to the EURUSD markets. You can see how the indicator plots the trends clearly. When price is rising steadily, you can see the SuperTrend indicator turn green, signaling bullish markets. When price starts to trend lower, the SuperTrend indicator turns red, suggesting downtrend is in play. The SuperTrend indicator also looks somewhat similar to the moving average crossover strategy you could use. The only difference here is that with the SuperTrend indicator, you just need one keep tract of one instead of two lines on the chart. How does the SuperTrend indicator work? 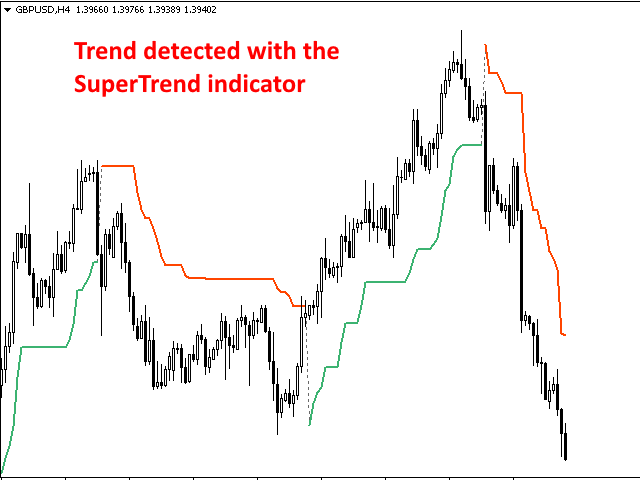 Using the SuperTrend indicator is quite simple once you understand how it works. The indicator makes use of a multiplier that is set to a constant of 3 and an ATR value of 10. In some instances, you might see the values of 3 and 7, respectively, being used. The ATR or average true range is an indicator that represents the true range that is averaged over a period of time. As you might have guessed, the SuperTrend indicator also makes use of the high/low values. Therefore, when you use the SuperTrend indicator on a 15-minute chart, you will get the average true range value of the past 10 candles of the 15-minute chart. Likewise, when you use the SuperTrend indicator on a daily time frame, it will use the 10-day average true range value with the same multiplier of 3. You will see that depending on the time frame and the values you use, the ATR value changes, thus influencing the output of the SuperTrend indicator. While the SuperTrend indicator comes with the default of 3 and 10, you are free to tweak these values to see if the indicator can give better signals. Because not all markets behave the same way, and the fact that volatility can vary greatly from one market to another, it is best to experiment with the SuperTrend indicator first with different values of the settings. However, before you do that bear in mind that the ATR plays an important role in this indicator. Because it depicts the volatility of the instrument, you need to choose the value that is optimal. Too small an ATR value can make the SuperTrend indicator to come under the influence of higher volatility of the ATR, whereas using a larger value can cause the SuperTrend indicator to be lagging. How can you effectively use the SuperTrend indicator? The SuperTrend indicator gives buy and sell signals based on the indicator's values. There is only one line plotted on the chart. Depending on the trading platform you use, the SuperTrend indicator can be configured to change the color of the line plotted. Typically, the SuperTrend indicator turns green when it is a buy signal and red when it is a sell signal. The SuperTrend indicator gives its signals when the values of the current session are compared with the values of the previous session. Some trading platforms also display the buy and sell arrows to alert you to the changes in the trend. A SuperTrend buy signal is given when the indicator closes below the price. 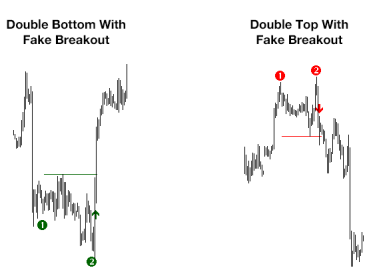 A SuperTrend sell signal is given when the indicator closes above the price. In a way, this looks somewhat similar to how a moving average works. A moving average indicator simply plots the average price. You know that price is in an uptrend when the closing price is higher than the average price. Likewise, you know that the trend is bearish when the closing price is below its average price. The SuperTrend indicator works in a similar way. Buy and sell signals are taken based on how price closes, relative to the SuperTrend indicator. So far, you have read what a SuperTrend indicator is and how it plots the values. You have also learned how the buy and sell signals are generated. 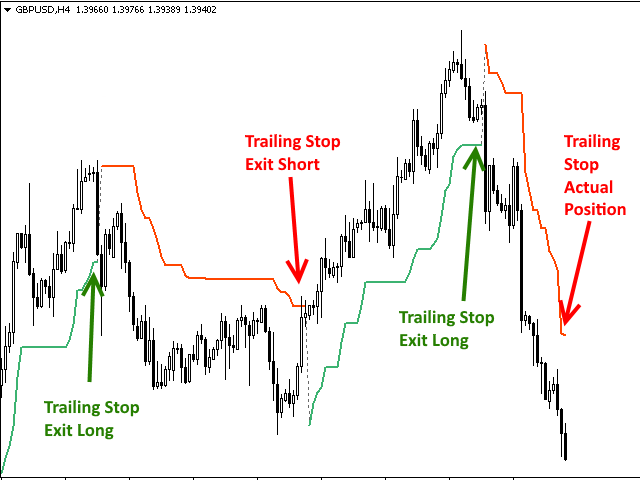 Let’s take a look at how you can trade with the SuperTrend indicator. It is important to note that the SuperTrend indicator can be used in many ways. For one, the general practice is to use the SuperTrend indicator as a trend following tool. When the SuperTrend indicator turns red, suggesting a sell signal, the markets tend to move lower. Thus, traders can initiate a short position here. It is up to the traders how they want to set the profit targets. If you are using only the SuperTrend indicator, then typically, the stops can be placed a few pips above the SuperTrend line. The same holds true for long or buy signals as well. You can place the stops at a few pips below the SuperTrend’s line. A trend changes when price breaks past the SuperTrend line. Therefore, when you get stopped out, there is a high probability that the SuperTrend indicator will indicate a change of trend. But this can also happen during sideways market. The chart below shows an example of the SuperTrend indicator applied to the crude oil markets. Commodity markets, as you might know, exhibit strong trends over prolonged periods of time. Thus, the SuperTrend indicator is a great way to illustrate the trends. In the above case, you can see how the dominant uptrend eventually capitulated leading to a trend change, depicted by the SuperTrend indicator signaling a bearish downtrend. However, as with almost all trend following indicators, beware of the sideways markets. In such situations, you can expect the SuperTrend indicator to turn flat and choppy as a result. Therefore, it makes sense to make use of other indicators that can alert you to any potential ranging, sideway market. It is recommended that you make use of an oscillator such as the relative strength index (RSI) or the stochastics oscillator to stay out of ranging markets. Divergence based methods are also useful in helping you to better identify the change of trend or direction of the markets. There are times when price can interact with the SuperTrend line. In some situations, the SuperTrend indicator can act as a support or a resistance line as well. The general concept being that price will need to break past the support or the resistance in order to change its trend. Another way to enhance the power of the SuperTrend indicator is to combine it with the Heikin-Ashi candlestick chart. Because this chart type can depict trends more clearly, you can trade only when both the Heikin-Ashi and the SuperTrend indicator are complimenting each other. This method is also effective and can keep you out of ranging or sideways markets. This can be seen in the above chart in Figure 3. Notice the last part of the trend which is up. You can see here how the Heikin-Ashi turns bearish briefly, only to test the SuperTrend indicator and then eventually turn bullish. Such signals can be a great way to trade simply based off the signals from the SuperTrend indicator and the Heikin-Ashi candlesticks. There is no technical indicator that can always guarantee you profits all the time. This is also the case with the SuperTrend indicator. Before you start using the SuperTrend indicator, you should bear in mind the following points. The SuperTrend indicator relies on volatility of the price. Therefore, you can make more profits when volatility increases and less profits when volatility falls. What this means for you as a trader is that the SuperTrend indicator can be a useful tool when trading economic news releases in the forex markets, or key fundamental releases when it comes to stocks. As you might already know, the SuperTrend indicator uses two values, which is the multiplier and the ATR. When you increase the multiplier, it will increase your risks dramatically, but at the same time, using a lower value for the multiplier will mean less risk but at the same time it can signal more trades. Just because you use a smaller multiplier will not in any way increase the profits. Depending on your trading platform, the SuperTrend indicator might look a bit different. However, the concept remains the same. The best way to gain familiarity with the SuperTrend indicator is to experiment with the settings and to choose the right moments to trade. As mentioned, when volatility rises, the SuperTrend indicator can signal strong buy or sell signals. You can then complement this with other trading indicators to fine tune your trade entry and exit points. To conclude, the SuperTrend indicator follows the concept of trend following. Therefore, traders should understand how this indicator works and complement it with other technical tools to increase the probability of their trades. As with any trend following strategy, the best profits are gained when you buy the dips and sell the rallies in an uptrend and a downtrend respectively. The SuperTrend indicator is therefore a versatile tool that can aleart you to the trends. Timing your entries is one of the keys for your trading success. Because you will most probably trade many different instruments (i personally trade 34 instruments) you can't watch all instruments on all time frames at the same time. Scanner indicators which constantly check many instruments on many time frames are doing a great job to give you real-time MT4 Alerts, Signal Emails and Push Notifications. On this page you can purchase one of these great helpers for a very low one-time-fee. But first let me explain how this great little helper works! As you can see in the following screenshot SuperTrend Scanner shows you a dashboard view of all instruments that you want to check constantly. You can see how easy it is with a dashboard to see the overall situation of the markets without checking each instrument / time frame directly on a chart. And that's not all! 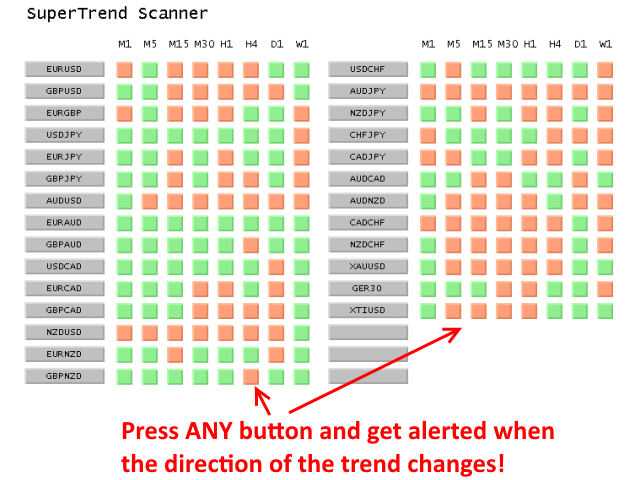 By pressing one of the green or orange buttons (one of the instrument / time frame combinations) you are telling the SuperTrend Scanner indicator that you are interested in a signal when the trend changes the direction. The Scanner indicator will then send you an MT4 Alert, an Email and a Push Notification in real-time in the moment when the trend change occurred! With this SuperTrend Scanner you will never miss a new trend again! You can get this smart little helper tool for a small one-time-fee and join the hundreds of traders who are already using it. 7 Days Money Back Guarantee! No questions asked. I will directly refund your money if you request within 7 days after your purchase. Exceptions: If you downloaded the FREE SuperTrend Indicator before the purchase or if I already answered questions about the product then I invested my personal time and then I can't give you a refund.